Metaluna - ZineWiki - the history and culture of zines, independent media and the small press. 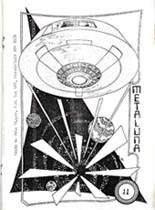 Metaluna is a media science fiction fanzine by John Tipper. Published in Strathfeld, New South Wales, Australia, forty five regular issues appeared plus several "specials", from April 1986 to 1997. The editor described it as "a media science fiction media fanzine with regular excursions into original fiction and art." it featured short stories, articles, and artwork, some of the content was devoted to such television series as Blake's 7, The X Files, and Babylon 5, and movies such as Forbidden Planet, and Dr. Strangelove. Contributing writers included Sue Bursztynski (Tales from New Wales), and Shane Dix. Contributing artists included Gail Adams (The Captain’s Log, Spock), Phil Cornell, Yvonne S. Hintz, Robert Jan, and Mike McGann. Metaluna is included in the Susan Smith-Clarke Fanzine Collection at The National Library of Australia. John Tipper also published the science fiction and comics fanzine MM, The UFO Files, Golden Years (on books and book collecting), and Serious Police Work (on the British police procedural series, The Bill).